J.P. Morgan Chase CEO Jamie Dimon said the American economy is divided between those who profit off of big corporations – and those who are losing out. 'I don't want to be a tone deaf CEO; while the company is doing fine, it is absolutely obvious that a big chunk of (people) have been left behind,' Dimon said during an event at the bank's New York City headquarters. Dimon, who is worth $1.3 billion, was speaking about a new $350 million program the bank designed to help create job opportunities for low-income Americans in under-served communities, according to CNBC News. Dimon has long been vocal about his concerns about the declining labor force participation rate – a measure of how many Americans are available for work (employed and unemployed) as a percentage of the population. In January the labor force participation rate was 63.2 percent. It's been going down in recent years as more workers give up looking for work after extended periods of unemployment. Dimon has also been critical of the education system, saying it's not preparing students to be part of the workforce of the future. 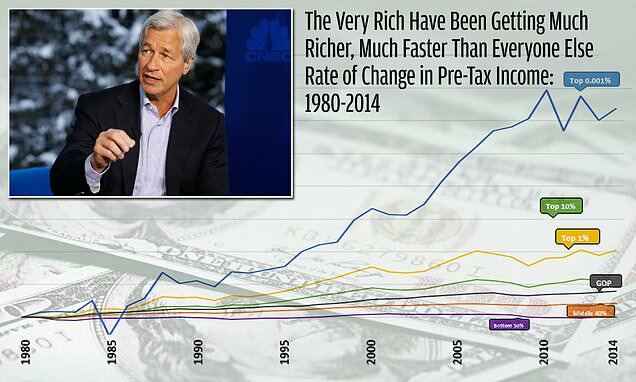 Dimon said that tackling the flawed education system will require leadership from companies like J.P. Morgan, in partnership with local organizations, to teach youth new skills outside of the traditional university setting.